The Residences at Lyon Hill in 2 sentences: Lyon Hill is an exclusive community consisting of 18 residences on four stories. Built recently and located just a short walk to the Clarendon Metro, Lyon Hill features 11-foot tray ceilings, gorgeous bathrooms, custom maple cabinetry, and other flawless upgrades that allow it to stake its claim as one of the most luxurious condos in Arlington. 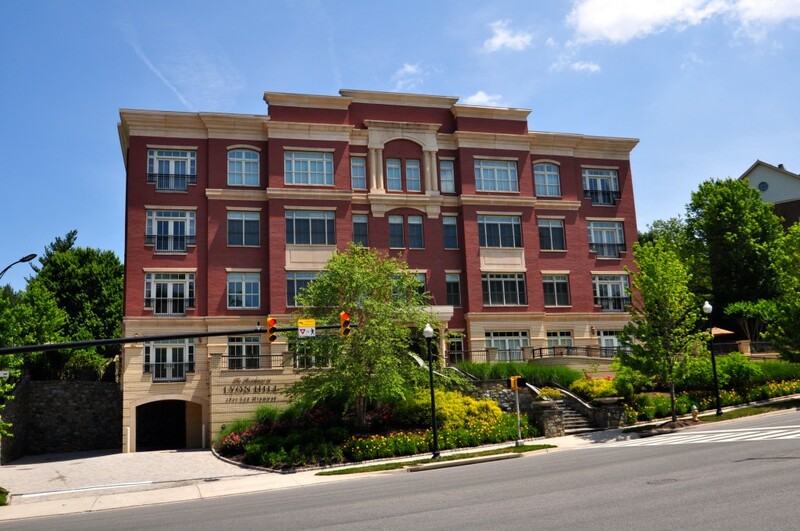 Perched atop Lee Highway near the Lyon Village neighborhood of Arlington, Lyon Hill is quietly making a name for itself as one of the more sought-after condo communities not only in Clarendon, but in all of Arlington. Built in 2006, this 18-unit community is located at 2801 Lee Highway. Upon entering the Lyon Hill reception lobby, you are immediately met with warm decor and a light, airy hallway that leads you through the first level. On the lobby level you will find a comfortable sitting area to go along with a fitness room. There are just three residences on the first level, while there are five residences on floors 2-4. Completed by Urban Vibe Developers, Lyon Hill features 18 layouts that may be similar, but all are unique floor plans. Residences start around 1,400 square feet for two bedroom units and work their way up to over 2,300 square feet for the larger three bedroom condos. The Residences at Lyon Hill condos feature hardwood floors throughout, top-of-the line finishes in the kitchen, 11-foot ceilings, fireplaces, marble baths, and many more upgrades in the living areas that will satisfy even the pickiest of tastes. Other features that set Lyon Hill apart are the large windows that bring in lots of natural light. The location of The Residences at Lyon Hill is a huge asset because there are no other structures obstructing the community to the south, and there is green space that buffers the building from neighboring communities on the other three sides. The amenities at Lyon Hill include an elevator, an outdoor terrace, and one level of underground reserved parking. Lyon Hill is located across the street from a grocery store and a 13 minute walk through Lyon Village to the Clarendon Metro. The biggest drawbacks of Lyon Hill are that it has no one bedroom layouts and there are very little amenities. One of the biggest advantages of Lyon Hill is that it is tough to buy into. Most of the owners are the original owners from 2006 and there is very little turnover in the building, a sign of strong quality of life. Another advantage is that it is tough to find 2,000 square feet along the Orange Line and Lyon Hill can certainly accommodate. It’s a wonderful, quiet building with large floor plans in a decent location.